If you do a search on this word, one of the items very near the top of the list is likely to be this offering "meetings, bloody meetings." I guarantee, if you utter the word "meetings" in most any gathering, someone will respond with some similar (if not identical) derogatory statement. It seems to be fashionable, acceptable, normal to hate meetings! Why is that? Mainly I think it's a bit of a self-fulfilling thing. Because we tend not to like meetings, we don't give them the kind of attention they need and deserve. 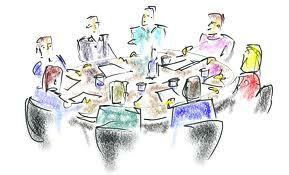 Therefore we approach our meetings without giving them adequate thought or planning. And they turn out accordingly. And we are confirmed in our opinions that meetings are things to be scorned. I spoke the other day about congregations getting back to a regular schedule of activities. Maybe you're also returning to thinking about your meetings. Here's a tiny bit of advice, hopefully to help you. Consider that in any organization--as small as a family, as large as a corporation or even a country--there need to be be two kinds of meetings. One is the Regular Meeting. It's called "regular" because it kind of regularizes who we are. This is the time we get together and look at each other and remember we belong together. We remind each other of our overriding vision and purpose and recall our priorities and values. We look around and notice our leaders, our leaders-in-training. We hand out certificates of appreciation, or long-service, or even retirement. We observe how we're organized and we celebrate who we are. Think family holiday dinners, openings of parliament, annual stock-holders' meetings, the congregational budget meeting (perhaps). Then there are the Working Meetings. This one is plural, because we have many more of these than we do Regular meetings. These are the generally much smaller groups who need to get together to gather information, figure out the critical questions, assign tasks to individuals or task forces, report back on how our task is going, brief and de-brief each other as we work towards our specific piece of the priorities we've shared at our regular meeting. They can be lots shorter, maybe even just touching base on the phone. This lesson could go on much longer, with lots more helpful tips about agendas and memory systems, but you've got the critical piece. Much of the time we mix up our purposes and try to cover too much. We think "if we've got these people here we'd better get it all done." We'd be better to keep them separate, and clearly so. Consider your meeting; decide which type it is; make sure everyone knows that; organize to serve the announced purpose. Doing this much should make your meetings work better and make your people appreciate what you've done and be more willing to attend your meetings.